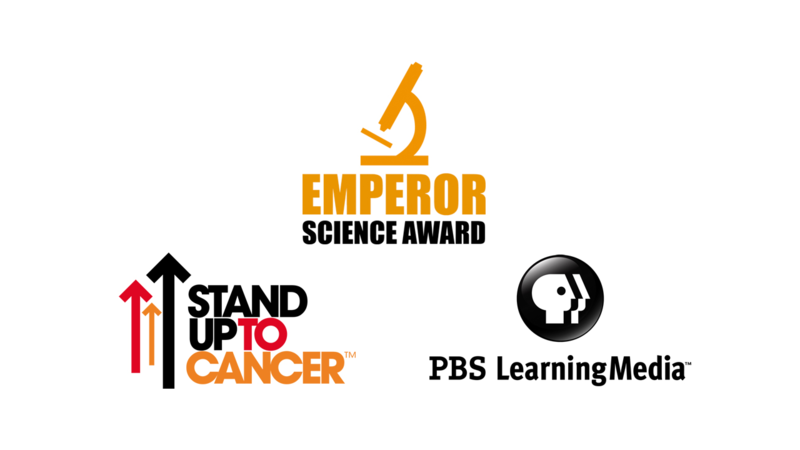 September 9, 2015: Stand Up To Cancer (SU2C), a program of the Entertainment Industry Foundation, and PBS LearningMedia, a media-on-demand service designed for K-12 classrooms, announced today the opening of applications for the inaugural year of The Emperor Science Award program. The Emperor Science Award program is an initiative designed to encourage high school students to explore careers in science, specifically cancer research and care, through a unique mentoring opportunity. The education initiative was first announced in spring 2015 by SU2C Co-Founder Katie Couric at Columbia University in connection with Ken Burns Presents CANCER: THE EMPEROR OF ALL MALADIES a Film by Barak Goodman, a three-part film on the history of cancer that aired on PBS in the spring of 2015 and can be streamed online here. The program aims to empower high school students to become the next generation of cancer and health researchers and will award 100 students each year, for at least three years, with an opportunity to work alongside an esteemed scientist on a rewarding multi-week cancer research project. Entry is open to students in the 10th and 11th grades living in the US and the District of Columbia who have a strong scientific interest, especially in cancer research and care. Special emphasis will be focused on students from economically disadvantaged high schools. Entries will be accepted from September 1 through November 1, 2015 at 11:59pm ET. In addition to the mentoring opportunity, students will also be awarded a Google Chrome Notebook to enhance their studies and to extend the reach of mentors to students living in rural and suburban communities, a $1,500 stipend for expenses, and the opportunity to continue the mentoring program, through high school, to further their academic pursuits. Students, including those who receive Emperor Science Awards, will be eligible to reapply in subsequent years. Essays will be judged on sincerity, creativity, clarity and persuasiveness. The Emperor Science Award Program has been made possible by generous support from Founding Donors Genentech, Bristol-Myers Squibb and Novartis. Their support will fund a total of 300 awards through the first three years. This initiative was organized by the CANCER: THE EMPEROR OF ALL MALADIES Education Subcommittee, chaired by Sherry Lansing, SU2C co-founder, chairperson of the Entertainment Industry Foundation’s Board of Directors and founder of the Sherry Lansing Foundation. Other advisory members include the creative team behind CANCER: THE EMPEROR OF ALL MALADIES, including Ken Burns (executive producer); Dr. Siddhartha Mukherjee (author); Barak Goodman (producer/director); and Pam Williams (executive producer; president, Laura Ziskin Pictures; SU2C Council of Founders & Advisors), and documentary production supporters. For a full Education Subcommittee membership list, click here. Stand Up To Cancer (SU2C) raises funds to accelerate the pace of research to get new therapies to patients quickly and save lives now. SU2C, a program of the Entertainment Industry Foundation (EIF), a 501(c)(3) charitable organization, was established in the United States in 2008 by film and media leaders who utilize the industry’s resources to engage the public in supporting a new, collaborative model of cancer research, and to increase awareness about cancer prevention as well as progress being made in the fight against the disease. As SU2C’s scientific partner, the American Association for Cancer Research (AACR) and a Scientific Advisory Committee led by Nobel Laureate Phillip A. Sharp, PhD, conduct rigorous, competitive review processes to identify the best research proposals to recommend for funding, oversee grants administration, and provide expert review of research progress. For more information about Stand Up To Cancer, visit: www.standup2cancer.org. As America’s largest classroom, PBS offers digital content and services for teachers of children from pre-K through 12th grade that help bring classroom lessons to life. PBS LearningMedia, a partnership of PBS and WGBH Educational Foundation, is a free and paid media-on-demand service offering educators access to the best of public media and delivers research-based, classroom-ready digital learning experiences to engage students in exploring curriculum concepts that align with National and Common Core State Standards. Nationwide, more than 1.6 million teachers and users have registered access to more than 100,000 digital resources available through PBS LearningMedia. More information about PBS LearningMedia is available at www.pbslearningmedia.org or by following PBS LearningMedia on Twitter and Facebook. Bristol-Myers Squibb is a global biopharmaceutical company whose mission is to discover, develop and deliver innovative medicines that help patients prevail over serious diseases. For more information, please visit www.bms.com or follow us on Twitter at www.twitter.com/bmsnews. Novartis provides innovative healthcare solutions that address the evolving needs of patients and societies. Headquartered in Basel, Switzerland, Novartis offers a diversified portfolio to best meet these needs: innovative medicines, eye care and cost-saving generic pharmaceuticals. Novartis is the only global company with leading positions in these areas. For more information, please visit http://www.novartis.com. For images and additional information on Ken Burns PresentsCANCER: THE EMPEROR OF ALL MALADIES A Film by Barak Goodman and other PBS programs, visit PBS PressRoom at pbs.org/pressroom.